Congratulations to Larry Wright, Winner of Event 30: $1,500 2-7 Draw Lowball ($101,975)! After three fast paced days of No-Limit 2-7 Lowball we’ve got ourselves a winner! 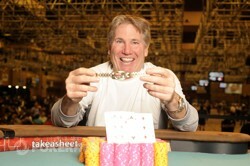 Larry Wright defeated a star-studded final table and a total of 284 players in order to claim a World Series Of Poker gold bracelet. After claiming the gold Wright said he had only learned how to play Single Draw four days ago, and accidentally mucked a deuce instead of an ace on day one when he was drawing one card. Wright didn't play as a rookie, and went on a tear today at this amazing final table! 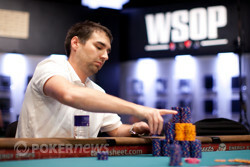 The first player at the final table of seven who got eliminated, was short stack Ryan Tepen. He started the day with just 51,000 chips and lost the first all in pot he played, against Michael Mizrachi. Tepen stood pat and turned over while Mizrachi broke his jack-nine. Mizrachi could've busted Tepen by standing pat, but did it anyway when he drew another jack to make a . Tepen took home $10,318 for his efforts. Mizrachi was running away with it early on and got his stack up to 450,000 after winning numerous pots. He got some fierce competition from Andrew Lichtenberger who sent Rep Porter home in sixth earning him $14,078. Porter started the day second in chips, but couldn't hold on to that position for long. On the final hand he played a massive pre draw all in against Lichtenberger who had the better pat hand. Porter was all in with while Lichtenberger had . After this hand Erick Lindgren was the short stack while Mizrachi, Lichtenberger, and Cantu kept battling it out for the chip lead. The short stack didn't find a way to come back as he got knocked about about an hour later. After a raise from Cantu, and a call from Mizrachi, it was Lichtenberger who made it 42,000 from the button. This was the sign for Lindgren to move all in, as he put his final 70,000 at risk from the big blind. Lichtenberger called and both players drew one card. Lichtenberger had and the better draw against Lindgren's . Lichtenberger hit a and that was it for Lindgren who was drawing dead. He would take home $19,676. Shortly after Lindgren was knocked out we also lost Mizrachi. You could call the last level he played some sort of blow up, but Mizrachi also ended up with a lot of second best hands at showdown, some of which were pretty unlucky. On his final hand Mizrachi got it all in pre draw against Cantu, and was in the lead with a better draw. Cantu showed and caught a giving Mizrachi plenty of outs to improve his . Unfortunately he caught a pairing his hand, and knocking him out in fourth place. He won $28,198 as we headed into three-handed play. With just three players left Wright was the short stack. Lichtenberger and Cantu both had big stacks and were close to playing each other heads up. But things turned out very different. Wright started his comeback at the right time as he found himself doubling through Cantu. After doubling up Wright kept winning pots and within a couple of hands all three stacks were dead even. From this point on Lichtenberger seemed to have lost his grip on the situation, as he quickly got shorter and shorter. 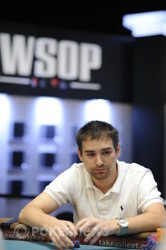 Eventually Lichtenberger got eliminated in third place earning him $41,445. 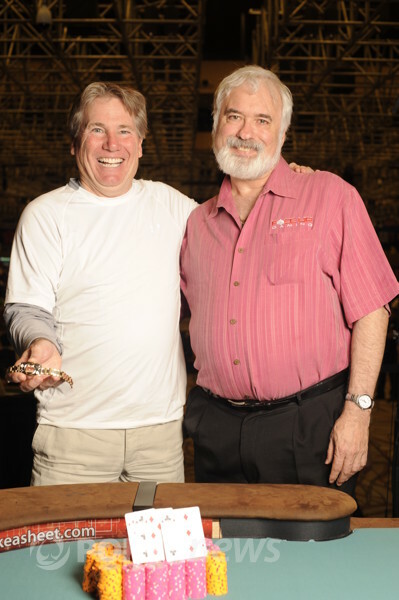 On Lichtenberger's final hand he raised on the button and Wright put in a three-bet from the small blind. Lichtenberger moved all in with and drew one card. Wright stood pat and showed . Lichtenberger caught a and got eliminated. Wright started off heads up play with a slight chip lead and never looked back. After grinding Cantu down to just 12 big blind they played the pot for the bracelet. Cantu was all in for his tournament life with a draw against Wright's draw. Wright hit a and that did it! His hand was unbeatable and Cantu's didn't matter anymore. Brandon Cantu got eliminated in second place earning him $63,048 while Larry Wright will walk home with his biggest prize ever, $101,975 and a World Series of Poker gold bracelet! The first time Brandon Cantu was all-in for his tournament life he was out. He moved all-in from the button for around about 120,000 chips, and after a moment's thought Larry Wright made the call. Both players drew one and the cards were on their backs. Cantu needed help but when he saw Wright table a he knew he was drawing dead. His went flying through the air, and he made a quick exit with his wife. Wright wasn't going anywhere and celebrated with his Texan rail, including wife and daughter. Larry Wright raised it up to 20,000 from the button to kick things off, and Brandon Cantu three-bet to 60,000. Wright followed with the call. Cantu stood pat, and Wright took one card. Cantu checked to Wright who bet 85,000, and that was enough to win the pot. Larry Wright raised to 20,000 from the button, and Brandon Cantu decided to throw in 60,000. Wright put out a big four-bet to around 280,000 and Cantu mucked his hand. Cantu is getting short, but he still has 26 big blinds in front of him. 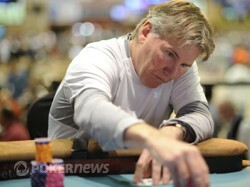 After winning two hands Larry Wright is now almost up to one million in chips. On the first hand Brandon Cantu raised to 20,000 from the button, and Wright called. Wright took one card while Cantu needed two. Wright bet 50,000 and Cantu laid it down. On the second hand Wright raised to 20,000 and Cantu called. Both players took one card. Cantu bet 20,000, Wright made it 45,000 and Cantu called. Wright tabled and took down this pot brining his stack up to 971,000. Larry Wright raised to 20,000 from the button, and Brandon Cantu decided to make it 60,000 to go from the button. Wright called. Cantu stood pat and Wright took one card. Cantu showed after which Wright showed a pair of sixes indicating he had paired up. The heads up match started off with a big win for Brandon Cantu, but ever since it's been going Larry Wright's way. Cantu just took down his first pot in quite some time. Wright raised to 20,000 from the button and Cantu defended his big blind. Cantu took two cards and Wright stood pat. Both players checked and Cantu showed in order to take down this pot. Larry Wright made it 16,000 from the button, and Brandon Cantu opted to make it 45,000. Wright wanted to play for some more and put out a four-bet to 145,000. Cantu folded and Wright raked in another pot. Event 30: $1,500 2-7 Draw Lowball Final Table Day!